The following guidance is specifically designed for users who have registered with Aviva for their AE qualifying pension scheme. Please note: this guide should only be used after setting up your pension scheme with Aviva. 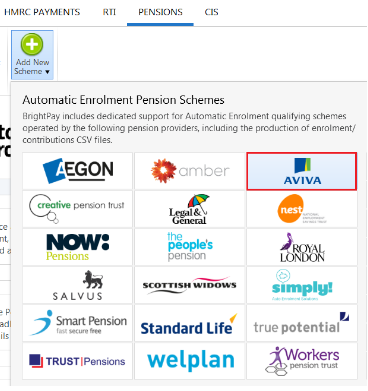 Please note: when entering your Aviva pension scheme details in BrightPay, care should be taken that details entered in BrightPay match exactly to how they are set up in your Aviva online account (taking into account upper and lower casing). This is to ensure that enrolment and contribution submissions will submit successfully for you. b) Within Registration Details enter your scheme reference in the field provided. This will have been given to you by Aviva when you completed their setup process. c) On the next tab, enter your Category ID. 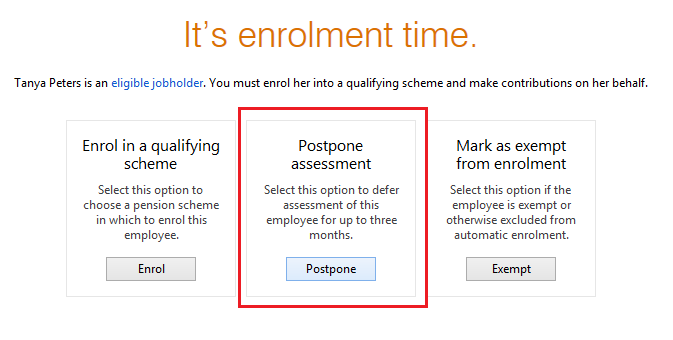 b) To enrol an eligible employee, simply select Enrol and choose your Aviva scheme from the drop down menu. c) Tax Relief - choose the tax relief method applicable to your pension scheme. (If unsure, please do check with the pension provider). BrightPay will automatically produce your enrolment file and each tax monthly contribution file that Aviva require for submission. Aviva offer an API option which will allow you to submit your enrolment file and subsequent contribution files directly from BrightPay into Aviva. This works very similarly to RTI where you just click one button and the submission is made. 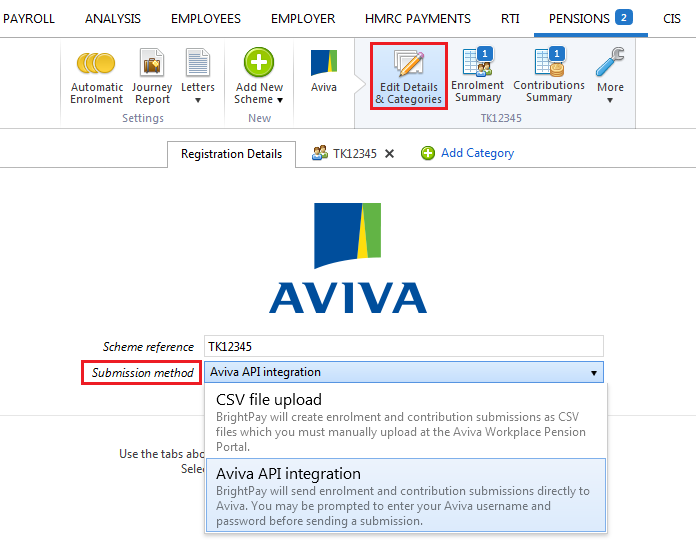 To use the API option, within the Pensions utility, simply select Aviva on the menu bar and select ‘Aviva API Integration’ as your submission method, followed by ‘Save Changes’. 1) To submit your enrolment file using API, select ‘Enrolment Summary’ and click ‘Send enrolment submission’. Complete each step accordingly and at the prompt, click ‘Send Now’. Enter your Aviva login details to complete the submission process. 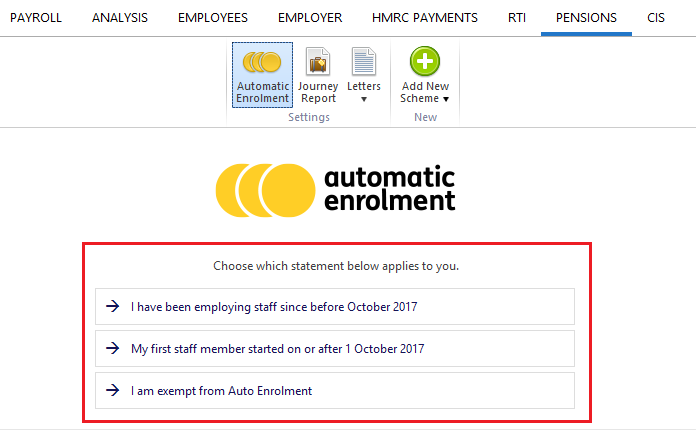 Similar to RTI, you will subsequently receive confirmation that Aviva has received your file at the top right of your enrolment summary screen. 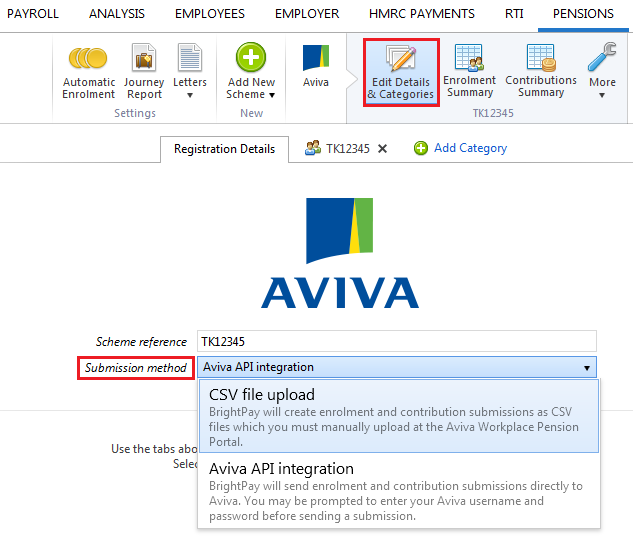 2) Likewise, to submit an Aviva API contributions file each tax month, select Contributions Summary on the menu bar and click ‘Send submission’. Select the tax month that you are submitting for and complete the screens that follow accordingly. At the prompt, click ‘Send Now’. Ensure your Aviva login details are entered on the next window in order to complete the submission process. Again, you will receive confirmation back into BrightPay that Aviva has successfully received your contributions information. Please note: only one contributions file is to be submitted each tax month, even if you pay your employees more frequently than this (e.g. weekly) or pay employees across more than one pay frequency. BrightPay will automatically create and update the contributions file relevant to the pay periods which fall in each tax month. The user must thus ensure the contributions file isn't submitted too early (that is, before all pay periods across all pay frequencies falling in the tax month have been finalised). 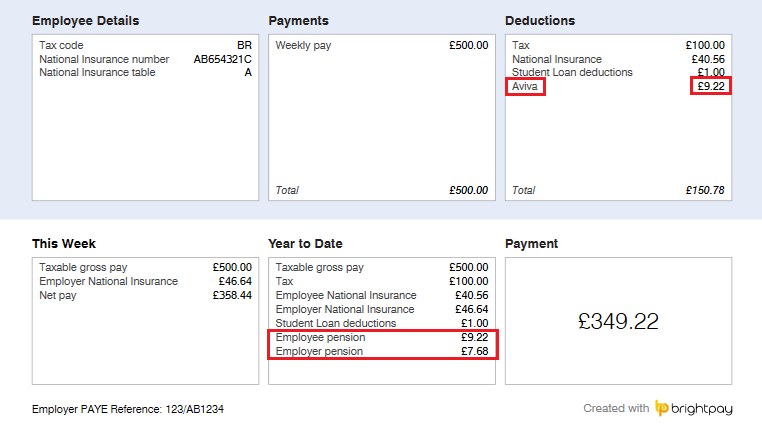 BrightPay also facilitates the creation of Aviva's enrolment file(s) and subsequent tax monthly contributions files in CSV file format. 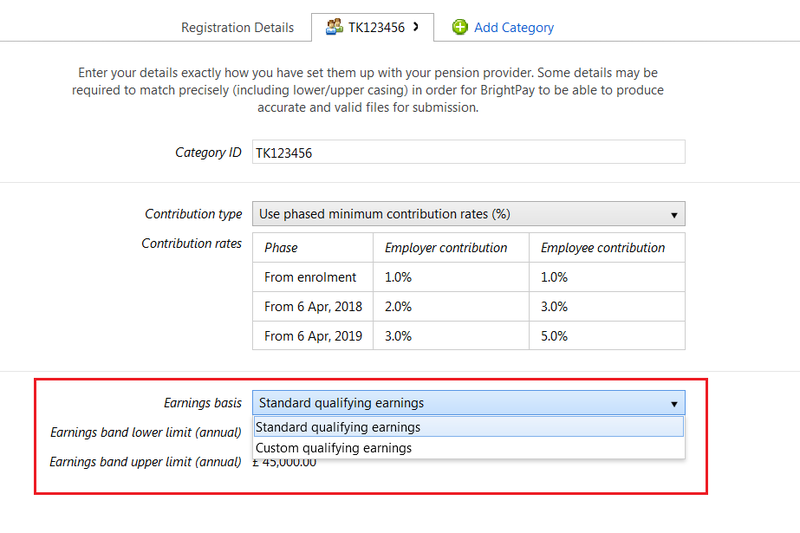 This is an alternative to using the API option and is most suited to those users who are not responsible for submitting the pension files directly themselves, but instead need to forward the pension files on to someone else for submission (e.g. a payroll bureau sending these on to a client for them to submit themselves). 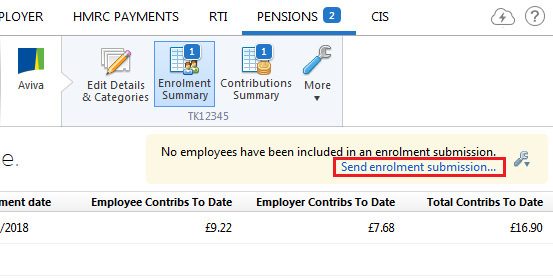 To use the CSV option, within the Pensions utility, simply select Aviva on the menu bar and select ‘CSV file upload’ as your submission method, followed by ‘Save Changes’. 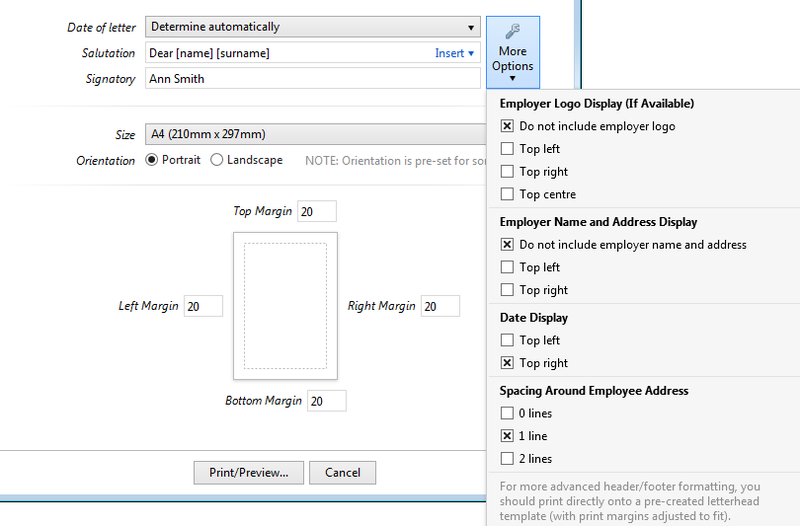 c) At step 1, select the employees you wish to include in your enrolment file. Click Next. d) At step 2, enter additional employee details as required. Click Next. e) At step 3, simply click ‘Save File..’ Save the file to a location of your choice, ready for upload into the Aviva portal. b) Choose the Tax Month period which you would like to create the CSV file for. Click Next. 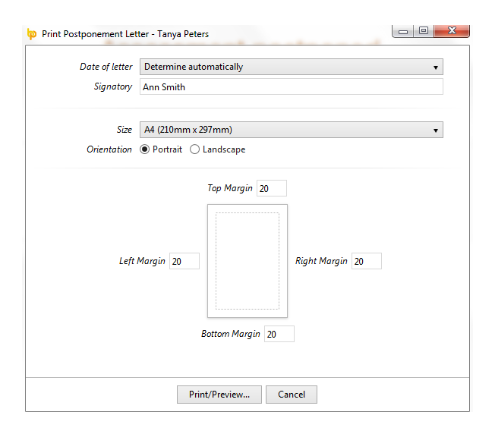 c) At step 2, select the employees you wish to include in the contributions file. Click Next. d) At step 3, for applicable employees, select a reason for partial or non-payment of contributions. For example, if an employee has left your employment, select 'No further contributions payable' to inform Aviva to no longer expect contributions for this employee. Click Next. e) At step 4, simply click ‘Save File..’ Save the file to a location of your choice, ready for upload into the Aviva pension portal.